In the late 1800’s, Pasqual Escobar was a share cropper living in a small farm town named San Juan De La Puerta, Guanajuato Mexico. He was an illiterate man working for low wages. The second Mexican revolution was looming; the boiling point was just around the corner in a town named San Luis Potosi, Guanajuato Mexico, as many of the disillusioned young men in the area were joining the revolution against a repressive government. Pasqual Escobar and his new bride Simona were just starting their family with their newborn first son Juan at about the same time railroad construction to the north was making its way from the east coast to the west coast of the United States. Pasqual’s aspiration was that his children would not grow up illiterate as he did. He was known to say that the only way out of poverty was an education. As the revolution was about to start, he would say that it didn’t matter which side was victorious, the status quo would remain the same. He learned that the United States had a program where they would employ Mexican labor workers to work on the railroads with a chance for permanent immigration. He also learned that the United States had a law that provided every legal resident child an education. As a young hard working ethical man, he had a chance to fulfill his dreams of providing a better life for his family and so made the journey north to the United States leaving behind his wife and son knowing that one day he would return for them. He embarked on a ship from what is now known as Ensenada Bay, Baja California and landed in Kansas, Missouri, and worked his way to the west. As the railroad work progressed and they got closer to the west coast, workers were granted occasional leaves. Pasqual would visit Simona in Mexico and always returned to work on the railroad circa 1900 – 1905. He had two more sons Jesus and Pasqual Jr. The revolution was close to officially starting and Pasqual sensed that the powder keg ready to explode. So, with his wife and three young sons, he migrated to the United States before a very violent war began. Circa 1909, he settled with his family in a town named Sherman which is now known as West Hollywood, California. With his sons now enrolled in school, he was able to settle down and leave his nomadic life behind by securing a job with the County Road Department as a laborer. The west coast building boom was well underway as the road work was completed circa 1919. After that work was completed, he found himself for the first time in his life without work. He came across a land developer building homes on a large parcel of land. He asked him for work as a laborer. He was shown how to build a cesspool and was taught by the developer how much to charge per foot. 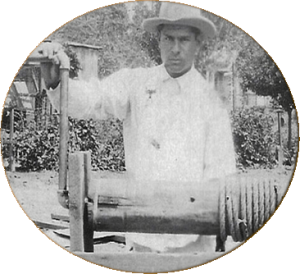 With that information and experience, Pasqual set out on his own, purchased a cart and ox and traveled around Los Angeles building cesspools wherever he saw a home being built. As his sons became of age around 1921, they joined him and formed Escobar and Sons Sewer Construction. As the Great Depression came and went, they were able to provide for their families. As Pasqual got older and he retired from all the years of hard work his three sons continued the business. Then came World War II. The Escobar Brothers were contracted by the United States War Department to construct sewer lines at the new air strips in Arizona and Nevada. When the war ended, they returned to what is now West Los Angeles. As the building boom continued with the Veterans Assistance Programs, home construction in West Los Angeles was at an all-time high. Escobar Contracting was now well established in the building community as the go-to company for any sewer or drain work. Escobar Contracting constructed most of the sewer lines in West Los Angeles – the main sewer lines for the city and house connections for developers and architects. As the building boom came to an end, Escobar Contracting become more of a service company focusing on sewer line service and repair. As time went on, Juan Escobar left the company to start his restaurant business. Jesus Escobar eventually retired leaving Pat and his son to run the company. In 1978, at the age of 74, Pat retired. He left his son Carlos to run the day-to-day operations of the business. In 1988, Carlos married Debra and the two of them, to this day, continue to manage and operate one of the most successful and entrenched businesses Los Angeles has even known.